Gotta have it or make it stop? Hello dolls. So this is a special triple edition of Gotta have it or make it stop. Camilla Belle wore this gorgeous slinky beaded Ralph Lauren gown, but the real secret weapon to the 20's inspired look was her ultra-bold, wine-hued lipstick, which perfectly complemented her almond eyes. 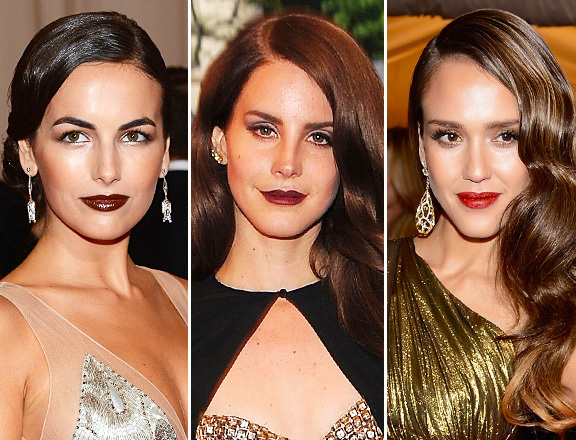 Lana Del Rey wore Altuzarra dress and a cape with dark color lipstick which went beautiful with brown smokey eyes. Jessica Alba looked to the brighter side with a cherry-tinted lipstick in her Michael Kors gown- just as dramatic, still just as gorgeous as the rest. Dianna Agron wore a flowing belted Carolina Herrera gown that looked youthful, fresh, and totally her. The same goes for Lena Dunham, who made the high-low hem work for her personality in a Wes Gordon sleeveless dress. Rounding out the indie factor was Greta Gerwig, who shone in Prabal Gurung's long-sleeved dress. Peplums have been a long time coming, first popping up all over the Spring/Summer runways way back in September. This season, though, they’re blooming into an all-out red carpet trend with Solange Knowles, Sofia Vergara and Emma Roberts leading the way. Solange wore the more traditional shape in a sunshine-y Rachel Roy dress that's flattering, cheery, and definitely wearable enough for everyone. Sofia Vergara upped the sparkle with an elegant silhouette in glittery Marchesa. And last but not least Emma Roberts in belted Escada gown, which was the perfect combination of eveyrthing - the color, the hair and accessories. And what do you think? Let me know by posting comments below.